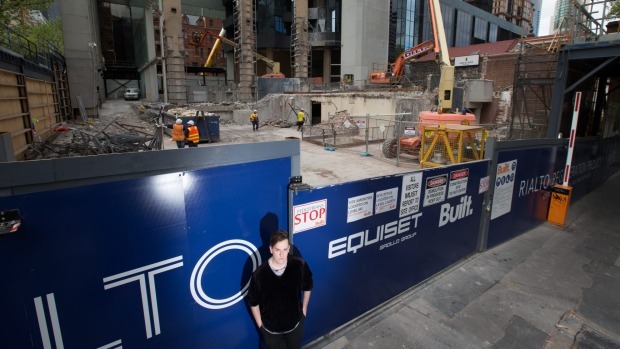 The Age is today reporting on the destruction of the C-graded, but unprotected facade of the former Robb’s building near the corner of King and Collins Street as part of Grollo Corporation’s Rialto redevelopment. Grollo’s Handiwork: Before, top and after, bottom. The annex is all that remains of the grand Robb’s building, which was itself demolished for the original Rialto development in the 1980s. At the time, the retention of the annex in perpetuity was supposed to compensate for the loss of the main building, a small gift to the city, which the Grollos have now seen fit to unilaterally withdraw. There can be no argument the demolition of the annex is in any way necessary given the size of the total development site. This situation highlights the dire urgency with which the City of Melbourne needs to conduct a comprehensive city-wide heritage review. 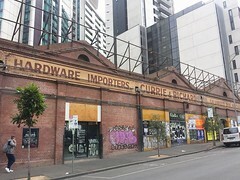 MHA has identified hundreds of recognised, graded heritage structures in the CBD and Southbank that similar to the Robb’s annex have NO HERITAGE PROTECTION IN LAW. 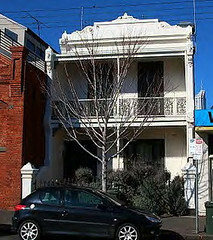 The City of Melbourne has a duty of care of all the graded heritage structures within its boundaries. 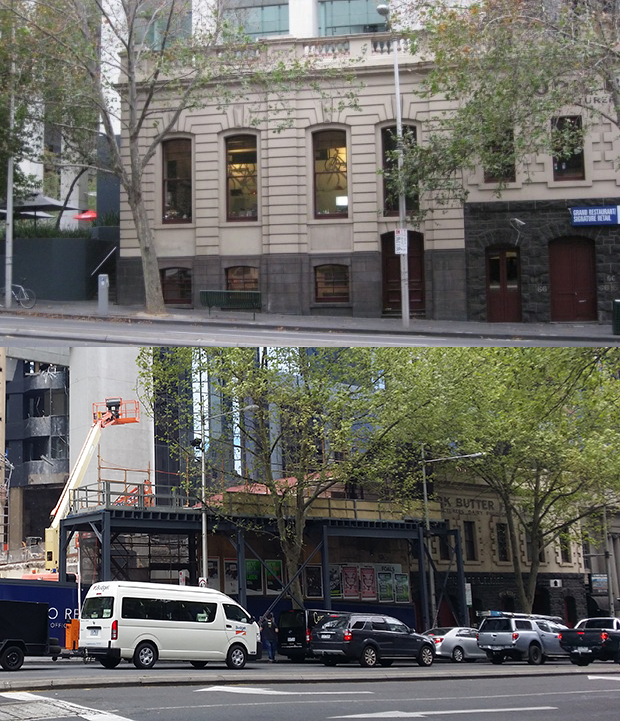 Council staff simply waving through the demolition of C-graded heritage structures coupled with the ineffective notification that the developer’s plans even included such intentions have led to a woeful outcome here, and there is no reason not to expect more of this in future. Please contact MHA for further information. Agreed – it is appalling how there is no accountability – C graded buildings contribute to our sense of the past in the present – the Robbs Annex housed a small cafe and was a welcome retreat from the shiny glass corporate world around it – it reminded us of a human scale and the past. There is no connection to history in the end its all about money. I am appalled, horrified and aghast that our beautiful, city of soul and historic significance, is so carelessly carved up and mutilated by these inhumane, beastly conglomerates!! It is total destruction of what we consider to be our heritage and a much loved city. I am crying! !